I’m a bit late to the game this year as far as VO Atlanta wrap-ups go. Between a touch of jet lag, (I made a rare-for-me decision to take an overnight flight back so as not to miss too much work,) a multi-day marathon of jobs and administrative stuff to sort through upon our return, and some post-conference crud floating around the house this weekend, I’ve been a little preoccupied. That said, three things stuck out for me at VO Atlanta this year, and all three are, in my opinion, highly important for our community and industry. I’ll get to them in a moment. Let me begin by paying the usual homage to the event itself, it’s familial undercurrent, and the brilliance of Gerald Griffith and his team. No battle plan survives first contact with the enemy, and I never fail to find it remarkable how the VO Atlanta organization manages to pivot successfully when confronted with the unexpected. Kay Bess was an inspiration to everyone, and there wasn’t a dry eye after her keynote. Seeing old friends and making new ones was as joyful as expected. 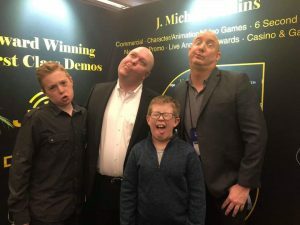 The traffic at the JMC Demos booth left my whole team with little downtime, (and a huge thank you to AJ, Kayla, Jas, the Sundholms, Megann, Brigid, Brad and Jace for their help.) And the closing ceremonies were moving and uplifting as always. 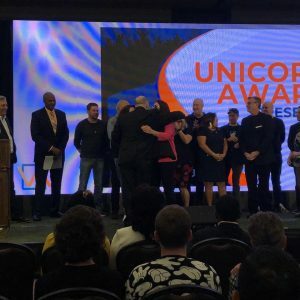 I expressed my gratitude to Gerald for filling a few minutes between bringing young Briley on stage and the Unicorn Award presentation…..I’m not sure I could I have held it together otherwise after seeing that courageous little girl. The tribute to Pat Sweeney put together by Elley-Ray and Jenn Henry was breathtaking, and it was a privilege to present a token of the community’s appreciation to his family. 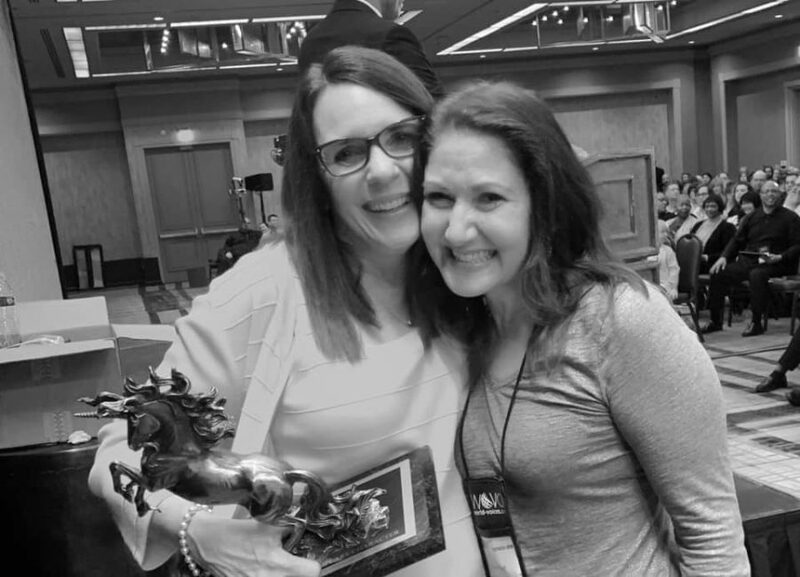 And, Michelle Blenker is our new Unicorn, selected from an impossibly worthy field of three finalists including Bev Standing and Doug Turkel….all examples of the better angels of humanity. So, on to the takeaways. This year there was an unusual amount of behind the scenes politics and contentiousness heading into the weekend. Various quarters of the industry had been quietly quarreling for some months, for reasons well known and others more esoteric. A number of us had some concern that petty disagreements and personality conflicts would come to a head this year in Atlanta in ways they had not before. It was refreshing, (which is appropriate,) to see that this was not the case. As always seems to happen in Atlanta, the communal celebration of our industry eased whatever conflicts may have been percolating, and reminded us all that while we may disagree on methods and philosophy, the kind of people who take the time to make the annual pilgrimage to the South all have the best interest of the industry at heart. For years, broadcast sectors have held the glamor position in voiceover. As competition has increased and pay has come under pressure due to market forces in Commercial VO, among others, many of us have been championing the advent of less-traditional parts of the industry as the path to a prosperous future. This year’s conference made clear that E-Learning, Corporate Narration, Explainers, and formerly niche areas like Political Commercials and Live Announce are becoming bell cows for a lot of talent. 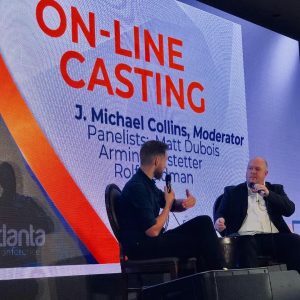 Instead of being treated as somehow beneath or less-than high profile broadcast work, these genres were recognized in Atlanta as being abundant, lucrative, and less competitive than other parts of the industry. E-Learning masters were highlighted as stars in a VO version of Revenge of the Nerds that most wouldn’t have seen coming five years ago. A lot has been written about my interview series with the CEOs of Vocie123, bodalgo.com, and Voiceovers.com. I’ll let the interviews and commentary by others stand without adding anything else here, other than one observation that I believe is critical. My big takeaway is that we may be seeing a gradual shift among online casting sites to two fairly distinct models, both based solely on the long-term interests and intentions of the site owners. Where the intention of ownership is to scale up operations with the possible purpose of cashing out in the long term via private sale or IPO, you can expect to see sites adopt models that look more and more like other gig economy platforms. This will take the form of paywalls at almost every interaction for the labor force on the site: Membership fees, commissions, possibly the introduction of paying small amounts for individual auditions, (see what Upwork is doing to their freelancers at the moment,) and the monetization of any possible convenience on the site. The more aggressive sites will try to implement the same on the buyer side. These sites will also center more and more around sorting metrics and AI, rating and categorizing talent in ways that make sense to Silicon Valley types but which seem cold and impersonal to creatives. The feel will be far more corporate than artistic. Ultimately, the philosophy is driven by chasing volume, not quality, and sites that follow this model will start to resemble Fiverr and freelance sites more and more, allowing virtually anything onto the platform and making their money in small increments on massive traffic. Private equity and corporate investors don’t really care about quality…..there is no money in a boutique high-end professional VO site. At least not what the investment community would consider real money. It is all about traffic and turnover. The more the merrier. Uber doesn’t care if you are going five hundred yards or fifty miles. They make money on both. Sites that follow this model will become less and less responsive to the community and to talent concerns, seeing themselves as tech platforms first, not stewards of the industry they serve. Customer service will cease to exist on these sites, and every encounter will be transactional. On the other side will be the industry-centric matchmakers. Sites which derive their income strictly from membership fees, playing no other part in the transaction and making the process as simple as possible for all players. These sites will continue to support and interact with professional talent, and will screen the jobs on their platforms for at least a minimum of quality. Their ownership and customer service philosophy will remain accessible because community acceptance and backing will dictate their success. Without recourse to pennies on the dollar volume transaction profits, they have to be responsive to talent and buyers alike in order to thrive. Ownership of these sites will find profit, but it will be in concert with that of their talent, and the owners will not be getting rich from these platforms. The biggest challenge they will face is attracting jobs when they are forced to compete for SEO relevance and traffic with the big aggregators. How well they meet this challenge will determine if the model will survive. Ultimately, online casting is in a state of flux, and other models may emerge, but for the moment this is where things seem to be moving. As always, diversifying your job sources will be critical to your future VO success. Platforms change. They will come and go. I remain convinced that a VO portfolio without online casting is a poor idea for most talent, but online casting should not be over-weighted in your mix. If it accounts for more than 20% of your income, it’s time to take a hard look at your approach. Great wrap-up, J Michael! Your insight is so beneficial to our community. As always it was a pleasure to see you again. One of the weekends highlights for me was getting to sit and visit (uninterrupted) with your lovely wife for about 15 minutes. Finding out what life is like for you and your family in Luxumberg was fun to learn. Thanks for being you. ‘Might the 20% model apply more to those who have been doing VO full time for several years?’ I ask, self-consciously. I’ve been a full-time VO for just over 3 years, and though I could comfortably live off of what I make in repeat customer income, my P2P bookings are almost quadruple that amount. Should I be concerned? I’d definitely be concerned if my VO income were more than 20% P2P. Platforms can change capriciously, and what is working well one day may not the next. I would look to diversify if you can. Great wrap up, J Michael! Had a long phone call with Randy Thomas recently, and she echoed what Kevin West had also told me: You’re the man with his finger on the pulse. Thanks. Maybe we can bring you to a Voice Acting Expo sometime. 67th one coming up!